Compatible - image with any laser or CCD imaging system. Compatible excitation wavelengths include green (543, 532 nm), blue (488 nm), violet (405 nm) and UV (302, 365 nm). Maximum emission wavelength is 610 nm. Rapidly detects proteins on nitrocellulose and PVDF membranes, allowing you to check the quality of protein transfer before proceeding to Western blotting. 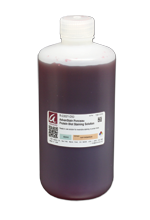 With AdvanStain Ponceau, you can quickly make sure that protein transfer has been even across the entire blot, and that no signs of bubbles or other transfer artifacts are present. The staining is reversible, and after destaining membranes can immediately be used for Western blotting.